Looking for big size for newsboy style hat in red? Our Red Cotton Elastic Big Size Newsboy Cap is the perfect choice for you! This big size red newsboy hat is also great for Super Mario outfit for Halloween or costume parties. This big newsboy hat fits from XL-2XL, or 2XL-3XL and as hat is fitted with elastic band closure hidden in the back, hat is easly stretchable as well. This hat boasts a plush and roomy 4 1/2 inches deep crown, leaving you plenty of space or extra breathing room for your head. Now, no worries for those of you who have big head sizes in our fabulous red cotton elastic big size newsboy hat and complete your Mario custome with this amazing hat as well! Available in red, lime, white, and black colors. 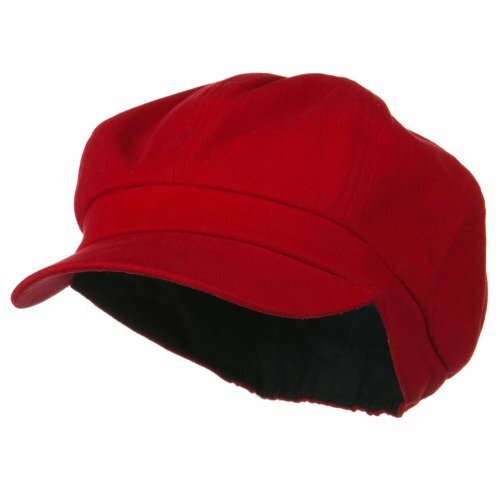 This red newsboy hat comes in big size, regular size and youth size as well. Made of 100 % cotton. XL/2XL(base 7 1/2), and 2XL/3XL(base 8) are available. Crown measures 4 1/2 inches deep in 8 panels, fully lined inside. Bill measures 2-1/4 inches long, pre curved bill. Thick and soft material. Handwash only. Available in red, lime, white, and black colors. Imported. XL/2XL(base 7 1/2), and 2XL/3XL(base 8) are available. Crown measures 4 1/2 inches deep in 8 panels, fully lined inside. If you have any questions about this product by E4hats, contact us by completing and submitting the form below. If you are looking for a specif part number, please include it with your message.